I wonder if they're going to talk about Gas? 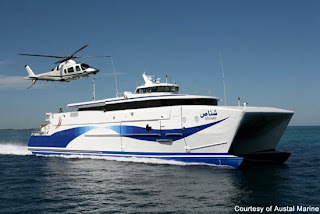 Now to the main item for today: The Khasab Ferry - National Ferries Company. Here's a picture of the ferry, looking like it's a millionaires toy with that helicopter... with the running costs of it, I'd suggest it was a billionaires toy! Yesterday, I read with some amusement on the Khimji Ramdas blog that the Shina's ferry has completed it's first year of service. I wonder how much money the Government has had to pump into this business to keep it afloat? I also wonder if it'd be cheaper to paint the boats in military colours and mount some guns on them, and use them as fast Israeli-funded Somalian Pirate catchers? I guess in their current format, they can at least make some money and keep some people employed. The question one might ask is, could more people be employed serving in the Navy? Looking at the NFC website, the fares have been published here. A return trip in cattle-class is RO 44 (or RO 22 if you're a resident of Khasab). Now that is not too bad, when you compare it to an Oman Air flight at RO 46. Ok so the flight takes an hour and ten minutes, whereas the ferry takes 6 hours. But with the ferry you get to see the coastline as you go up. Interestingly there is still no mention on the Jetty, and whether you can take your car with you or not, on the NFC website. Rather alarming that 12 months on, still no jetty is in place - or is it? I have no idea, not having been on the ferry service. However, at that price, I think I might fly one way, and ferry back - and handily enough, the good people at Oman Air have smelt an opportunity and offer just that. For RO 99 per person, you can fly one way, stay two nights at the Golden Tulip in Khasab, and then take the ferry back the other way - I think you can choose to fly or ferry up, and fly or ferry back. I think I'd prefer to ferry up and fly back myself. The deal includes breakfast on both mornings, and it's actually a very good deal indeed when you factor in two nights at the Golden Tulip. Co-incidentally, the Golden Tulip franchise here in Oman is owned by the Ministry of Tourism. I wonder if all of this subsidizing is actually costing the Government even more money? There are no economies of scale with that ferry, are there? That's all for today. I guess the big news is waiting on Thursday, when we will, hopefully, find out that bid for Blue City's bonds has been accepted by the bond holders. Contracts for construction of jetties at Shinas and Khasab were recently awarded. There will not be a jetty at Muscat. Thanks for the update Muscati - I did'nt know about the Contract awards. I guess they've moved away from the car-ferry idea then. I wonder if they'll re-use the space for something else? I think a run between Shinas and Khasab would be better, and if a profitable (after writing-off the cost of purchase) run between Abu Dhabi or Dubai and Khasab could be done, then that would be a boon for tourism in the area as well. Did you notice there was nothing in the main Omani Press articles except a straight reprint of the Iranian Fireign Minister's statement. Then a whimper of a report. I did, and I blame it more on the fact that there are so few actual journalists here, just copy writers. They will have car ramps in Shinas and Khasab. You just won't be able to load/unload cars in Muscat. Drive up to Shinas, load your car onto the ferry, weekend in Khasab.. return through UAE with a stop in IKEA. Perfect long weekend plan. I believe the ferry service has become more popular now and if the number of passengers using the service is any indication. The crew at Muscat is hospitable, access-sable and reasonably quick. But the crew at Khassab most of them are crap.Slow in action and less hospitable and vasta plays major role. While I traveled from Muscat to Khassab the ferry was delayed by 15 to twenty minutes because of a late comer had to park his car inside. The crew lowered the ramp once more and good cooperation. But while returning from Khasab I had a bitter experience. Reporting time was changed from 2.30 to 1.30 noon which was not informed while booking my ticket.I reported by 2.35 considering the previous reporting time and the staff in the counter couldn't accept the delay. I tried to convince why I was I delayed the intimation on changed reporting time was not printed on ticket and neither was informed while the ticket was issued.However they said it is question of their job security and they could not cooperate.As my journey was important I cancelled my ticket and took up the road for my return. Cancellation further cost me another 15 rials. I consoled myself that someones job shall not be in trouble because of me.That became a cruel joke during my next journey from Khasab. I reported in time thats by 1.30 sharp. Boarded in time parked my car and patiently waited to start by 3.00 PM. It didn't start anyway until 3.10 and what I noticed then was lowering the ramp again to board one land cruiser.I could imagine that he must be some one having little bit vasta with the staff and therefore no threat for anyone's job. The travel started by 3.20. While this is meant for attracting tourists to the country why the personnel preference of staff getting more attention and real tourists getting embarrassed like this...?